The card making ideas that are available for making the UniqueCard™ live up to its name are limitless. I'll give you many ideas that will get you going, after that the only limit is your own imagination. Note: If you've already made a ClassyCard™, you'll notice that the first part of these instructions is similar. The only difference is that you are now downloading the same image that I use to make my highly successful line of art cards. 2. Click on the UniqueCard™ link under the image. 5. Save the image to a folder that you'll remember. Suggestion.....create a new folder called "UniqueCards". If you've already learned the printing steps in the ClassyCard™ section, you can skip to the border application by clicking here. Even if you've got one of these programs, you might find one of the following approaches attractive. 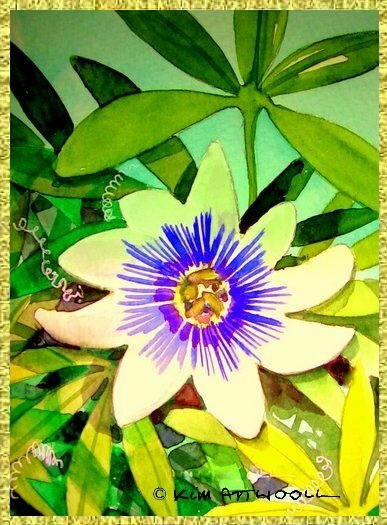 Picasa in particular is full of editing functions that I use to create many of my new card making ideas. 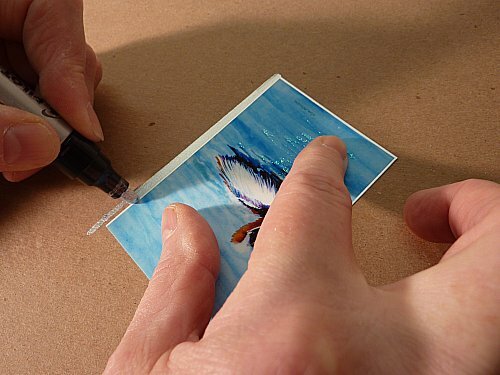 This is the beginning of the process that will make your card outshine a simple printed card. 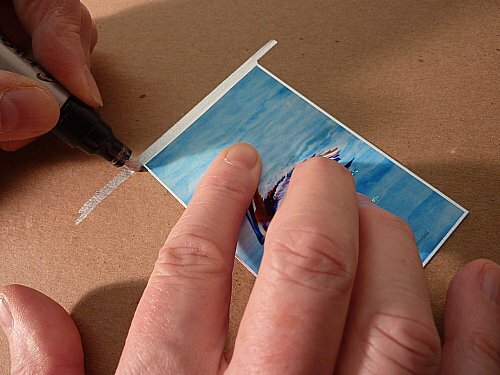 You'll learn how to apply a gold or silver border. Even the best printers don't have gold and silver in their palettes. 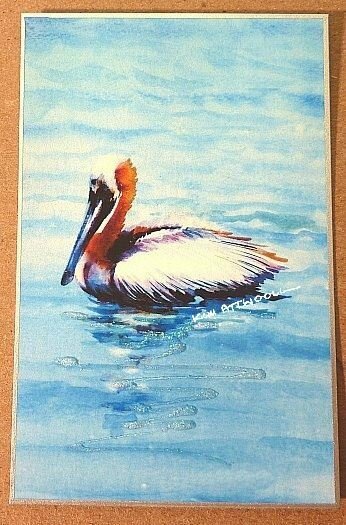 This is the first of many simple card making ideas that will make your cards stunning! 1. 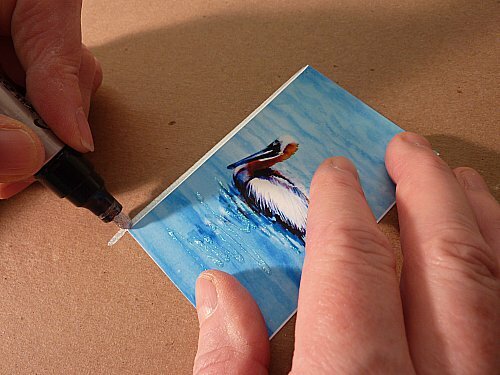 First, carefully cut out your printed image, preferably using a paper cutter but if you don't have one, use a utility knife with a sharp blade and a metal straight edge. 2. I've always found that the Pilot medium markers give the best results for the borders. They're available at Staples, Office Depot, Quill and art supply stores. Feel free to experiment, you might find something that works better for you. I choose gold and silver because they lend themselves to framing in standard metallic 5 x 7 frames and actually work well in any frame. Rich reds and greens work wonderfully on many Christmas greeting cards. This is all about your card making ideas, so play with the colors, there are so many possibilities. 3. 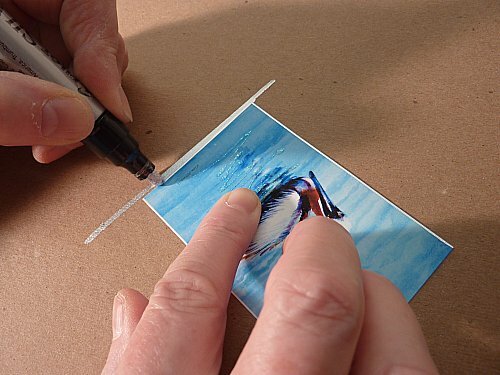 Hold the image firmly on a piece of scrap board or paper and using about half the width of the tip, pull it steadily along the edge in one smooth stroke. Part of the paint stays on the image and part stays on the scrap. 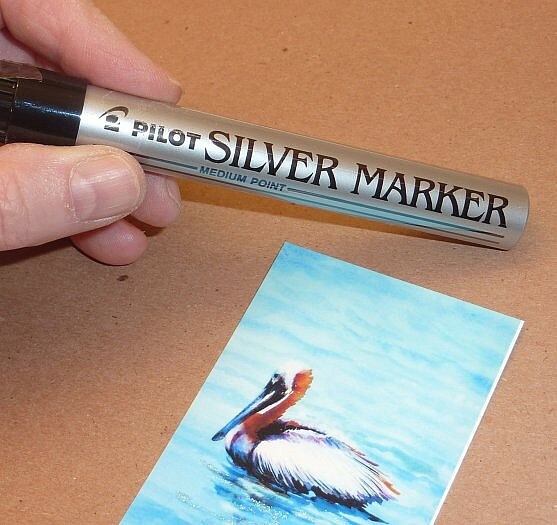 The thickness of the photo paper that you printed on serves as a guide for the marker. Try practicing on a few scraps of the photo paper. I always test my marker first on a "sloppy copy". 4. Turn the image 90 degrees and repeat step 2. 5. You've got it. Turn the image 90 degrees and repeat step 2 again. 6. Last one! Turn the image 90 degrees and repeat step 2 again. If you've already learned the mounting steps in the ClassyCard™ section, you can skip to the Making it Unique area by clicking here.